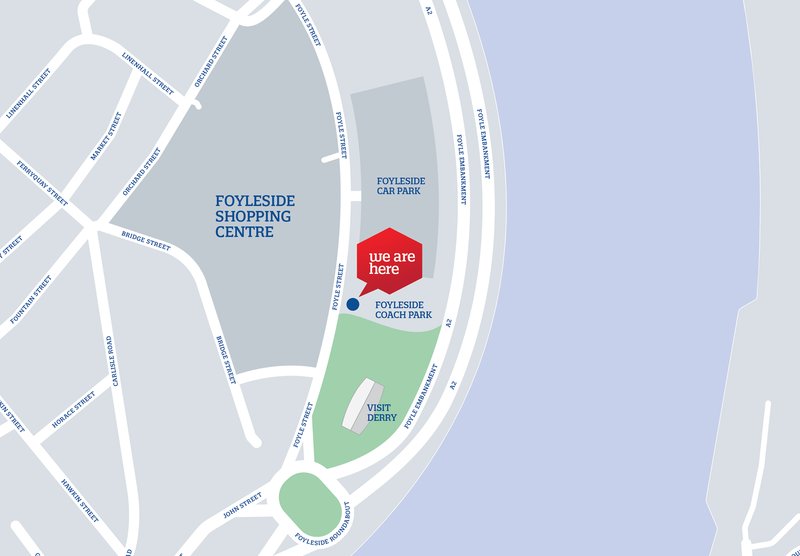 The Airporter pick up point is now located at Foyleside Shopping Centre Coach Park. All passengers will picked up from and dropped off at the new stop at Foyleside Shopping Centre Coach Park. The consecutive stops at Altnagelvin (Waterside), Claudy Crossroads, Dungiven and Maghera Flyover will remain the same. Where is the new pickup point located? This new pick up point is in a much more central location within the City and provides ease of access to onward travel and to City Centre hotels and accommodation. I have already made my booking from the Bay Road stop, what should I do? If you are travelling with Airporter from the 7th January onwards and have already made your booking from the Bay Road stop, your booking will change to the new stop from the coach park at Foyleside Shopping Centre. Please feel free also to contact us for more information on the change, you can get us on 028 7126 9996. Will car parking be available for customers? Car parking is available in the Foyleside Shopping Centre. For more information click here.